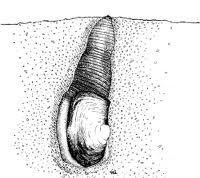 Size: The largest burrowing clam int the world, attaining a shell length of at least 8.5 inches (21.6 cm) and a live weight (including the shell) of 7 pounds (3.2 kg). A few giants have been recorded at 14 and even 20 pounds (6.4 and 9 kg). In buried adults, the long contractile siphon may extend 39 inches (1 m) to reach the surface of the seabed. Range: The West Coast of North America, from Alaska to Baja California. Habitat: Lower intertidal and subtidal zones of bays, sloughs, and estuaries, to depths of around 360 feet (110 m); most abundant between 30 and 60 feet (9.1 and 18.3 m) below the mean low tide mark. 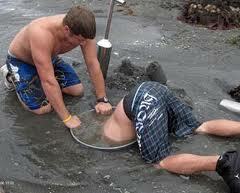 Burrows in a variety of substrates, ranging from soft mud to pea gravel, mostly in stable mud or sand bottoms. Food: Phytoplankton, primarily diatoms and dinoflagellate species. Predators: Crabs, shrimp, sea stars, snails, fish, sea otters, and humans. Gordon, David G. People for Puget Sound: Field Guide to the Geoduck. Seattle: Sasquatch Books, 1996. 12-43. Print. Washington State Department of Fish and Wildlife. N.p., 2011. Web. 21 Feb. 2011. <http://wdfw.wa.gov/>. Shellfish Aquaculture Regulatory Committee, Washington State Department of Ecology, http://www.ecy.wa.gov/programs/sea/shellfishcommittee/index. Goodwin, Lynn, and Bruce Pease. "Pacific Geoduck Clam." U.S Fish and Wilflife Service Biological Report 11.120 Dec. (1989). Web. 21 Feb. 2011. Kozlof, Eugene. Seashore Life of the Northern Pacific Coast. (Seattle: University of Washington Press, 1983). This page was last modified on 7 March 2011, at 18:18. This page has been accessed 3,458 times.